A row of wind mills at the Wild Horse Wind Farm. Perched to take some photos. 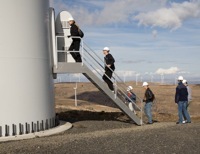 Tour of one of the wind turbines. 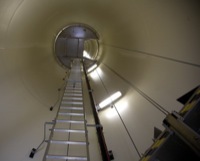 Climbing into the base of the turbine. Inside the column, looking up part of the 200-foot ladder. The group and our tour guide, Adam. Charging at the vistor center.